As a business owner, you may feel a little overwhelmed when it comes to collecting and remitting sales tax. We have prepared this guide so that you can feel confident that your sales tax obligations are taken care of. Our Georgia Sales Tax Guide will give you the confidence to manage your Georgia sales tax needs from beginning to end. If you have any other questions to help you navigate your way through Georgia tax sales, we are here for you. ☐ Have you wanted to contact the State of Georgia Sales Tax Department? ☐ Are you unsure if you should call them, or email them through their website? ☐ Have you ever wondered what information you should have ready before you contact them? If you answered “Yes” to any of these questions, we have the answers for you. Even though it is 2019, you may be surprised that you still need to contact the State of Georgia by phone as a business taxpayer. While they do have a website, the only email address provided for contact information is for this with Alcohol and Tobacco related questions. Now, I know some people may think this is a disadvantage. Surprise! Surprise! Old-fashioned telephone calls seem to still be the most efficient method for handling your tax matters. You may contact the Georgia Department of Revenue at (877) 423-6711. I promise, this will expedite your call. It will also save you valuable time that you can spend on building your business. One more thing... If you are calling on behalf of someone else who is the taxpayer (whether an individual or a business), please be sure to get a Georgia Power of Attorney signed before you call. For the State to talk to you legally about a third party’s taxes, you need to have one of these bad boys, so you do not waste your time. Are you a new business and unsure if you need to register for sales tax in the state of Georgia? If so, you are in the right place. ☐ Do you sell tangible items? ☐ Or, do you provide services that are subject to taxation? If you answered “Yes” to either question, you need to register for a sales tax permit in the state of Georgia. Registering for a sales tax permit can be stressful, especially if it is your first time doing it. But there is good news, you only need to do this once. Your sales tax registration will remain in effect for the duration of your business if there are no significant changes to the business such as ownership or structure. In that case, you may need to renew or make changes to the registration. For your initial registration, the process is quite simple so long as you are prepared. I am going to walk you through it right now. Other requirements such as a Tax ID or other agencies you may need to register with. As my clients frequently ask about these topics, I am going to give you all the information about these topics. How do I register to collect sales tax in Georgia? New businesses may register for an Georgia Sales and Use Tax Certificate of Registration online by visiting the Georgia Department of Revenue and following the instructions provided. If you prefer, you may register for a Sales and Use Tax Certificate via snail mail. You just need to complete and mail in State Tax Registration Application (CRF-002). We don't recommend registering via snail mail as it is being phased out. What information do I need to register for a Georgia sales tax license? Remember, preparation is essential. Once, you have all this information, you can go online and register for your sales tax license at the Georgia Department of Revenue website. How much does it cost to register for a Georgia sales tax license? I have more good news for you. There is no cost to register for a Georgia Business Tax License. Do I need a federal tax ID number or EIN to register for a sales tax license in Georgia? Do not fret! It is simple and easy. You can register for a Federal EIN here. Which agencies in Georgia do I need to additionally register with? This answer is not so straightforward- every business is different. You need to verify with the Georgia Department of Revenue which government agencies you will be required to register with. You know you do not need to pay a fee, so there is no need to worry about that. You should have acquired a tax ID or EIN. You have determined what other agencies you may also have to register with. Registering for your sales tax license will be smooth as long as you are prepared. I suggest keeping all the needed information in a folder, both in hard-copy and soft-copy so it is just a click away. And do take advantage of the resources available online and through your tax professional. By now, you have probably contacted the Georgia Department of Revenue. You maybe even registered for a sales tax license. But now, you need to know when to charge a sales tax. Let’s discuss the basics of taxable goods in the state of Georgia. Don’t worry if you’re unsure when to charge a sales tax and when not to. These two questions are quite common for new business owners, like yourself. When do you charge a sales tax? Let’s look at some frequently asked questions from my clients to illustrate the nuances of when a business needs to charge sales taxes in Georgia, and when a business doesn’t need to. What products are considered taxable or not taxable in Georgia? If you are selling a tangible product that does not fall into one of the exceptions, you need to charge a sales tax. In addition to knowing what kinds of goods are taxable, you also need to keep in mind some other factors that trigger a sales tax in the state of Georgia. Is Georgia an Origin or Destination Sales Tax State? What creates a sales tax nexus in Georgia? What is the economic threshold in Georgia? Does Amazon have fulfillment centers in Georgia? Does Georgia have a Click-Thru Nexus? Why? These questions reveal that knowing when to charge a sales tax is more than knowing if a product or good is taxable. These frequently asked questions concern the nature of the business and nature of relationships between the buyer, seller, and any third parties in the sale of products and goods. Georgia is Destination Based Sales Tax State. Origin Based Sales Tax, which you charge based on your business location. Destination Based Sales Tax, which you charge based on the location of the buyer. As such, you want to ensure you appropriately charge sales taxes in your point of sale or eCommerce software, or risk under or over collecting. PROTIP: Charge Georgia sales tax based on the location of the buyer. Now that we know what kind of sales tax state Georgia is, we need to also consider other factors that require businesses to collect Georgia sales taxes. There are several thresholds a business may establish that will trigger sales taxes in the state of Georgia. In discussing this issue, I will address three commonly asked questions by my clients that deal with recognizing when a business has reached a threshold. Does Georgia have a Click-Through Nexus? If you are overwhelmed with determining whether your business has established a nexus with the state of Georgia, you should not worry. By looking at these three questions in more detail, you will be better equipped to recognize when your business creates a nexus, or if your business has already created one. Afterwards, there are ways you can manage your tax needs using some tools and resources we will go over in discussing the variety of thresholds recognized by the state of Georgia that constitute a sale tax nexus. This question applies to businesses located in Georgia and businesses outside of the state of Georgia. If you create a sales tax nexus with Georgia, you are subject to sales taxes. A Sales Tax Nexus is also known as "sufficient business presence.” It is legal jargon that essentially means you have created a taxing connection with a state. In other words, you have to charge sales tax in Georgia because you created a Sales Tax Nexus. What if your main headquarters are in another state? You may still have to charge pay sales tax to the Georgia Department of Revenue even if you never step foot in Georgia. So, how do you create a Sales Tax Nexus in Georgia? In addition to these six ways in which a business creates a sales tax nexus, businesses located outside of the state of Georgia can find themselves subject to Georgia sales taxes via the Economic Nexus. An Economic Nexus occurs in two situations. The first is when your gross revenue is at least $250,000. The second is when you have engaged in at least 200 transactions in the state of Georgia. Only one of these situations needs to occur to create an Economic Nexus. There are indeed several thresholds that establish a sales tax nexus. PROTIP: When you hit a threshold once, you have created a Sales Tax Nexus moving forward. Do you sell your products on Amazon? Are you an Amazon FBA (Fulfillment by Amazon) seller? If so, you have greatly increased your chances of creating nexus in each state that Amazon has a warehouse. For instance, you need to know if they store your products at one of these warehouses in Georgia. If they do, you have created a Sales Tax Nexus with the state of Georgia. You’re probably asking yourself Why? If you inventory ends up on the shelves of one of Amazon’s fulfillment centers, you may have created a nexus with that state. PROTIP: You create sales tax nexus by holding your goods in a warehouse in the State of Georgia. Considering Amazon has numerous fulfillment centers throughout the United States, this could make the whole process of figuring when to charge sales tax in Georgia even more intimidating. We can help guide you through this process. We often use A2X + Wherestock to identify where our clients' inventory is currently being held and shipped from so that we can keep them in compliance. Yes, Georgia has Click-Through Nexus. This question is important if you hired someone to promote your products. You may have created a Sales Tax Nexus in the state of Georgia if they promoted their products there. A business hires an affiliate marketer in the state of Georgia. The marketer does not sell the good directly to the buyer. Instead, they just promote the products and goods. 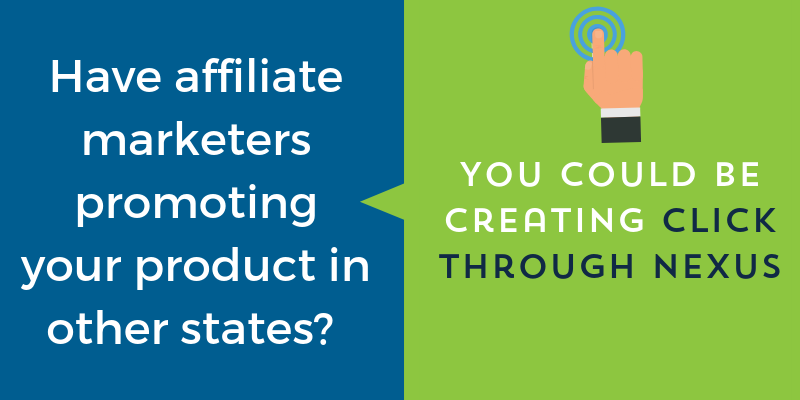 Using an affiliate marketer creates a Sales Tax Nexus that is specifically know as Click-Through Nexus. Receiving a commission on the sales made through their marketing campaign. In other words, even though the goods never actually pass through the hands of your affiliate, you have created a Click-Through Nexus subjecting you to the sales tax regulations. Click-Through Nexus can be super tricky, but it is very important to understand the implication of employing an affiliate marketer. PROTIP: With click-through nexus the seller is ultimately responsible for any taxes that need to be collected resulting from the affiliate generating sales. In conclusion, even if the seller is not located in the state of Georgia, the seller is subject to the sales tax regulations if the sales reach over a certain threshold. Georgia's current click-through nexus rate was $50,000 in the preceding 12-month period. If your affiliate marketer(s) sells less than that in a one-year period, you are golden. Altogether, there are three main thresholds that trigger a sales tax requirement in the state of Georgia. A Click-Through Nexus based on where you promote your products. Collecting sales taxes in the state of Georgia does not need to be burdensome. Keep these thresholds in mind. Being aware of when you need to collect and pay sales taxes in the state of Georgia, you can avoid audits, fines, and repayments. To more effectively manage your Georgia sales taxes, your eCommerce software will track where your product has been shipped from and where it is headed, so you should be able to easily see the volume of sales in both dollar amount and number. Yes, Georgia participates in the Streamlined Sales Tax program. Streamlined Sales Tax, aka SST, is an effort by local and state governments to help ease the burden of collecting and remitting sales tax. As of now, not all 50 states are part of this program. However, if you are subject to Georgia sales tax regulations, you should consider registering your business with the SST to make your sales tax life easier. Knowing when to charge sales tax in Georgia is one of the most important aspects of navigating your tax burdens as a business. The first step is identifying if your business has created a sales nexus with the state of Georgia. The next step, if you establish a sales tax nexus with the state of Georgia, is to use the tools and resources such as the Streamlined Sales Tax Program to alleviate your tax burdens, so you can focus more on your business and making money. Keep this guide handy to help you determine when to charge a buyer sales tax, so you and your business can be better-equipped to avoid situations like paying fines, repaying back taxes that you did know you had to pay in the first place, or facing an audit by the tax authorities in Georgia. Having this information accessible will help you handle your tax needs more effectively in less the time. Collecting sales tax in Georgia is required for businesses who have a sales tax nexus with the state. One you recognize you need to collect taxes, you may have questions about how to go about that. 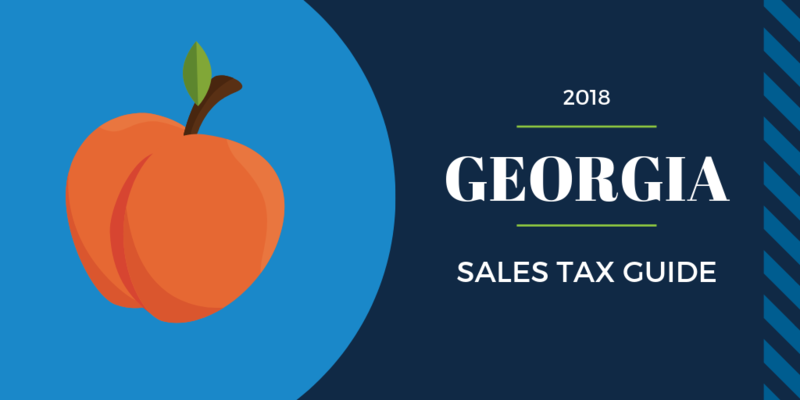 How do I collect Georgia sales tax? Who is eligible for Georgia Sales Tax Exemptions? What should I do if my customer is exempt from sales tax in Georgia? What happens if I lose a Georgia sales tax exemption certificate? How do I collect sales tax in Georgia? As discussed previously, Georgia is a Destination Based Sales Tax State. So, if you live in Georgia, collect sales tax based on the sales tax rate at your buyer’s address. Your eCommerce software should be able to calculate this for you on the fly. What are the current Georgia sales tax rates? Sales Tax Rates change all of the time- and vary by what is being sold! It's best to check out the GeorgiaDepartment of Revenue site here. What is exempt from sales tax in Georgia? Machinery and chemicals used in research and development. In addition to knowing what products are exempt from sales tax in Georgia, it is important to also know who may be exempt. Under Georgia law, taxable goods may be eligible for a sales tax exemption depending on the type of buyer or the way the goods will be used. A good example of this is a merchant purchasing goods for resale, aka a wholesaler. Out-of-state buyers (should their business not have nexus in their home state). Altogether, sales tax exemptions apply if the buyer falls under one of these categories. Selling to buyers who are tax-exempt is something every business owner eventually encounters. The responsibility here resides on the seller—you! It is up to you to collect a Georgia sales tax exemption certificate at the point of sale and to keep it on file. Such certificates must be produced upon request in the event of an audit to justify tax-exempt sales. Failure to produce the tax exemption certificate may result in the outstanding tax being passed on to the seller. Remember, you want to collect and file a copy of the certificate. If you are audited and cannot produce an exemption certificate for a buyer, you may be held responsible for the uncollected sales tax by the Georgia Department of Revenue. In some cases, late fees and interest will be applied. Remember, when you have a customer who is exempt from sales tax in Georgia, you want to collect and file a copy of the certificate in the event of an audit by the Georgia Sales Tax Department. If you lose the copy or fail to keep a copy on file, you risk being held responsible for the sales tax yourself. This is similar to what happens if you did not collect sales tax for a buyer who is not exempt. Altogether, if you did not collect it and can not prove that you did not have to collect it, you still owe it. Does Georgia have a sales tax holiday? Now you know who to collect sales tax from and for what, who and what is exempt from sales tax, and how to collect sales tax in the state of Georgia. Once again, remember to keep a copy of any certificates exempting a buyer from sales tax. Being prepared makes collecting sales tax in Georgia easy, as well as answering to any potential audits. When is Georgia sales tax due? What are the Georgia sales tax thresholds? What if a Georgia sales tax filing date falls on a weekend or holiday? How do I file a Georgia Sales Tax Return? How do I correct a Georgia sales tax return? Do I need to file a return if I don’t collect any sales tax in Georgia? Does the Georgia Department of Revenue offer a discount for filing on time? By the time you finish reading this, you will feel confident enough to file and pay your Georgia sales tax. There are three thresholds you need to know. It is important to note that each mentions a 6-month period. The difference between the monthly and quarterly threshold is whether the averages sales tax is less than or greater than $200/month. If it is greater than $200/month, you need to file and pay sales taxes monthly. 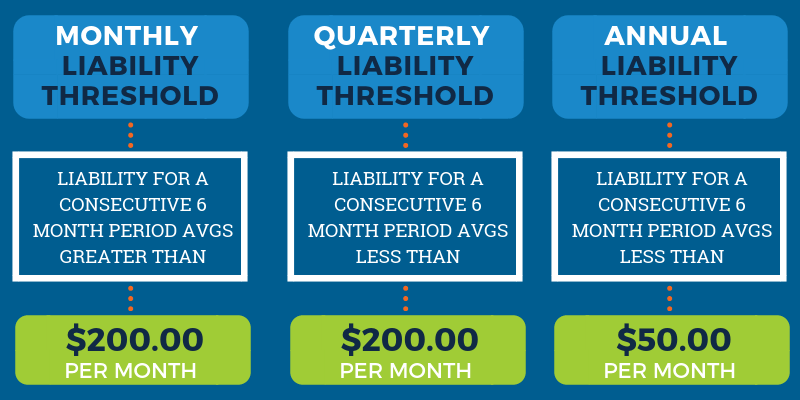 If it is less than $200/month, you may pay quarterly. If you average less than $50/month in sales taxes, you can file and pay annuals. As you collect more and more sales tax, you will be required to file and pay sales taxes more often based on an annual, quarterly, or monthly basis. Not sure how to determine your tax liability? You can review your sales tax liability reports in two ways. One is through your eCommerce software. The other is through your point of sale to see how much sales tax you have collected. Either way will help you determine not just your tax liability, but your corresponding threshold: annual, quarterly, or monthly. Watch your mail for a letter from the State of Georgia so that you don't miss any deadlines. If the sales tax deadline falls on a weekend or holiday, the deadline is moved to the next business day. This is typically the Monday following the weekend or the day after the holiday. However, we recommend paying the sales tax before their due so that you don't accidentally miss a deadline. 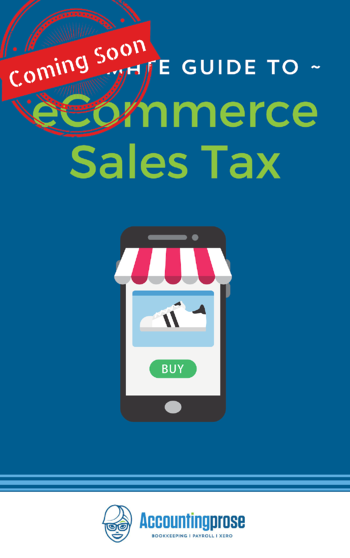 You can prepare and remit sales tax in one of two ways: by paper or electronically. To file and pay electronically, you can visit the Georgia Department of Revenue online. ProTip: Filing electronically is required when the tax liability is greater than $500.00. Did you make a mistake when filing your sales tax return? You can fix your mistake easily on both a paper and electronic return. You should amend the return in the same manner in which you filed it. If you filed electronically, login to the Georgia Department of Revenue. On the website, you will be able to re-file/amend the return for the intended period. The amended return should reflect the changes to the original sales. The amended return should use the same tax return information. The amended return should include even the unchanged data. Now, you should be all set to refile or amend your return if needed. Click the link below if you wish to learn more about amending a sales tax return. Oh no! You were supposed to collect sales tax in Georgia and you did not. This can happen for two reasons. One, you did not know you were supposed to. Two, you choose not to collect sales tax. Either way, you will be held responsible for the tax due. PROTIP: You still owe the Georgia Department of Revenue for sales taxes if you did not collect them from the buyer. Do not try to avoid paying them if you made a mistake in collecting sales taxes. If you ever get audited by the Georgia Sales Tax Dept and they find that you owe back sales tax, they will hit you with penalties and fines. It's best not to file your Sales Tax late. However, it can happen. So, if you do, it is important to know what sort of penalty you are in for. 5% of the tax due or $5, whichever is greater, for each tax type on the delinquent return for each month or fraction that the return is delinquent up to 25% or $25, whichever is greater. Interest: 1% per month or fractional part on any unpaid tax from the due date until paid in full. Yes, 3.0% on first $500 and 0.5% on any remaining amount with no maximum. You should be taking advantage of this discount each month! Now that we covered all our bases for filing and paying sales taxes in the state of Georgia, you should feel more at ease about the process. You can file and pay your taxes electronically or by mail. If your tax liability is more than $500, you need to file electronically. If you need to amend a return, do so in the same manner (electronically or by mail) that you filed originally. If you don’t collect sales tax and you were supposed to, you (not the buyer) is liable to pay the sales tax to the state of Georgia. Need more help with Georgia Sales Tax? Please note: This blog is for informational purposes only and the information is accurate as of 11/01/2018. If you want legal advice on sales tax law for your business, please contact a Sales and Use Tax professional. Keep in mind that sales tax regulations and laws are subject to change at any time. While we strive to keep our blog current, this blog may be out date by the time you review it.